This article is part of an on-going series of blog posts at the IT Experts blog. Solid state drives for computer systems are old technology – they have been available for over a decade. The earliest solid state drives (SSDs) were based on DRAM, the same underlying technology as modern memory – although they were often priced well in excess of regular memory (and beyond the reach of consumers) due to the engineering and integration efforts required – and the willingness of enterprise customers to pay top dollar. So while SSDs are themselves unremarkable, it is NAND flash (used in most modern SSDs) that will have a profound impact on the storage business for both technical and economic reasons. This article focuses on the latter – how NAND flash can actually be cheaper than a hard disk for low storage capacity applications. The economic argument for low-volume, high-end NAND based SSDs is relatively simple – higher performance for random I/O operations. A single NAND SSD can achieve 10-30K random I/O operations per second (IOPS), while a single SAS disk can achieve perhaps 250 IOPs. For some database operations, such as random reads or writes (e.g. using an index) the SSD may outperform the disk by 3-4 orders of magnitude. The list price for an enterprise database license (Oracle, DB2 or SQL Server) ranges from $5K-50K, so spending a few thousand dollars to double performance is an easy choice and this rationale extends to other expensive applications equally well. However, DRAM based SSDs also offer this same benefit – albeit at higher prices. In later articles, we will delve into the fundamental operation of NAND flash and SSDs and explain this performance advantage. NAND flash is a truly disruptive technology in the low-end of the market. Since flash is non-volatile it can replace hard disks for permanent storage – unlike DRAM, which is volatile and hence does not directly compete with hard disks. In the low-end of the market the fundamental difference between hard disks and NAND flash is not performance – but is cost and capacity. The mechanical components of a hard disk – a hermetically sealed case, actuators, arms, magnetic heads, ball bearings, etc. have a minimum cost of around $20, and the disk controller might cost $3. The smallest capacity of a hard disk is a single platter and additional platters provide incremental capacity. In a modern 2.5” hard drive, the smallest capacity platter is 160GB and that capacity will increase over time as areal densities improve. The smallest NAND storage solution is a single chip. The cost of a single NAND flash chip varies based on market conditions, but is generally in the range of $1-$8, depending on performance and density. At present, the cost of a 32Gbit (or 4GB) NAND chip using multi-level cells (MLC) is approximately $7, and the controller is the same price as for hard disks. Increasing capacity for NAND flash is as simple as using additional chips, and scales up linearly. This means that for certain capacities, NAND flash actually costs less than the minimum cost of a hard disk – which is precisely why USB thumb drives always use NAND flash. 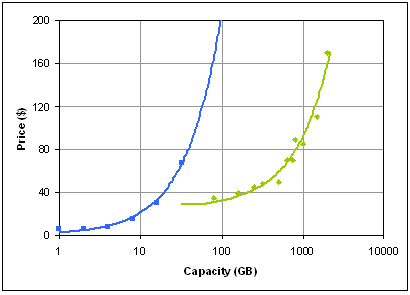 Figure 1 above illustrates the cost curve of NAND flash and hard disks from 12/17 at an online retailer. NAND is shown in blue, while hard disks are shown in green. Note that the lowest capacity (and lowest price) for a hard drive is 80GB, which is priced at $35. The 16GB NAND flash is slightly less expensive at $30. That is approximately where the cost curves for the two technologies intersect – the cross-over point. At or below the cross-over point (i.e. 16GB and below), NAND flash is cheaper, while above the cross-over point (i.e. over 16GB) hard disks are more cost effective. NAND flash is fundamentally a semiconductor device and benefits from the increased density due to Moore’s Law. Hard disks also benefit from exponential increases in density for storing data, so there is no risk that NAND will overtake hard disks. However, the disruptive aspect of NAND flash is that the cross-over point changes over time – in tune with Moore’s Law. Today, the cross-over point is ~16GB; in two years from now it will be ~32GB, and in four years, 64GB. If the cross-over point is more than the amount of storage needed – people will end up shifting to NAND storage to reduce costs. In reality, that is a bit of an oversimplification since NAND has other benefit besides cost (e.g. energy efficiency impact resistance) that are valuable. On the other hand the amount of data storage tends to increase over time. Digital media such as photos, MP3s, DVDs, Blu-Ray, etc. all increase the need for storage and are a better fit for high capacity hard disks in some respect. So for users with a large appetite for media, hard disks will still make sense for a long time to come – consider that a lossy rip of a 2-hour 1080p movie takes up around 10-15GB. But the general trend seems to be that the market for storage will split into several pieces: cost focused, performance focused, and capacity focused. Right now it looks like the first two may be dominated by NAND flash, rather than hard disks.